AAEA Hollywood: Prince: "LOtUSFLOW3R," "MPLSoUND," "Elixir,"
Prince's three CD bundle will be priced at $11.98 and can only be purchased at Target. He is also doing an unprecedented three consecutive night run on "The Tonight Show." The CD drops on March 29. "LOtUSFLOW3R," is a collection of psychedelic rock songs, "MPLSoUND," (short for Minneapolis Sound) features an electronic sound, and "Elixir," is album by singer Bria Valente, the latest in a string of Prince protégés. Prince better be tight on Jay Leno's show because George Clinton and his Gangsters of Love set the bar very high when they performed "Ain't That Peculiar" last year. UPDATE: His sets were tight (see below). GC is surely proud. 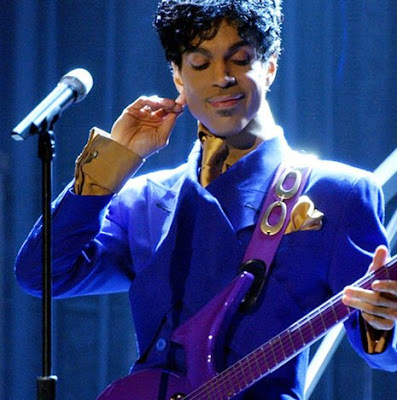 Prince is still the top live box office draw on the planet [you listening Michael?]. His muscianship is second to none and he and Beyonce burned down the house at the Grammy's a couple years back. Critics seem to feel obligated to find something bad to say about Prince. We will not. For Prince rocks. Case closed. Uh? By the way Mr. Prince Rogers Nelson, what about that gig with Environment Man & the Ecology Band?